NASA’s latest mission to Mars, InSight, is set to launch early Saturday morning in pursuit of a number of historic firsts in space travel and planetology. 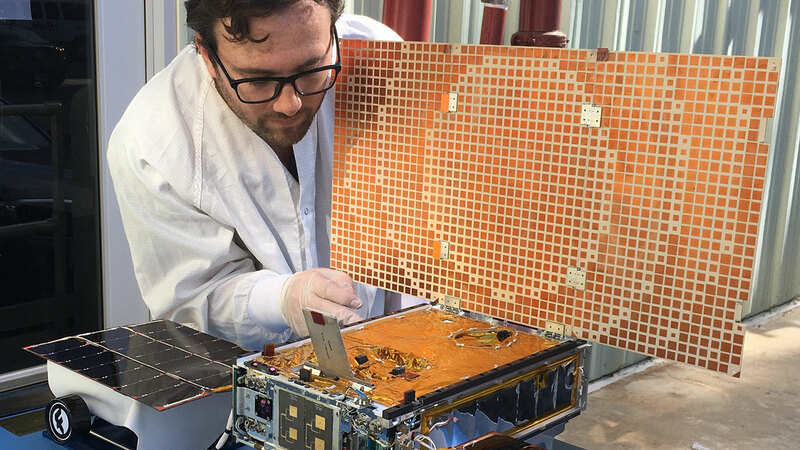 The lander’s instruments will probe the surface of the planet and monitor its seismic activity with unprecedented precision, while a pair of diminutive CubeSats riding shotgun will test the viability of tiny spacecraft for interplanetary travel. Saturday at 4:05 AM Pacific is the first launch opportunity, but if weather forbids it, they’ll just try again soon after — the chances of clouds sticking around all the way until June 8, when the launch window closes, are slim to none. 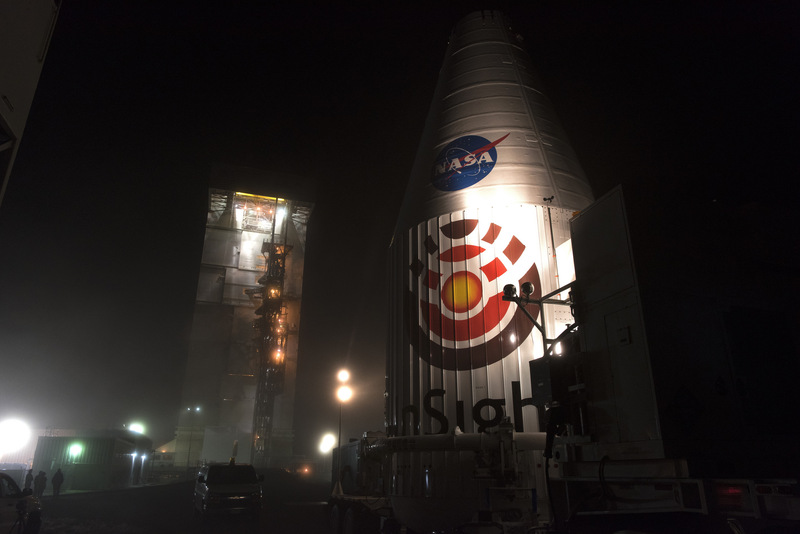 InSight isn’t just a pretty name they chose; it stands for Interior Exploration using Seismic Investigations, Geodesy and Heat Transport, at least after massaging the acronym a bit. 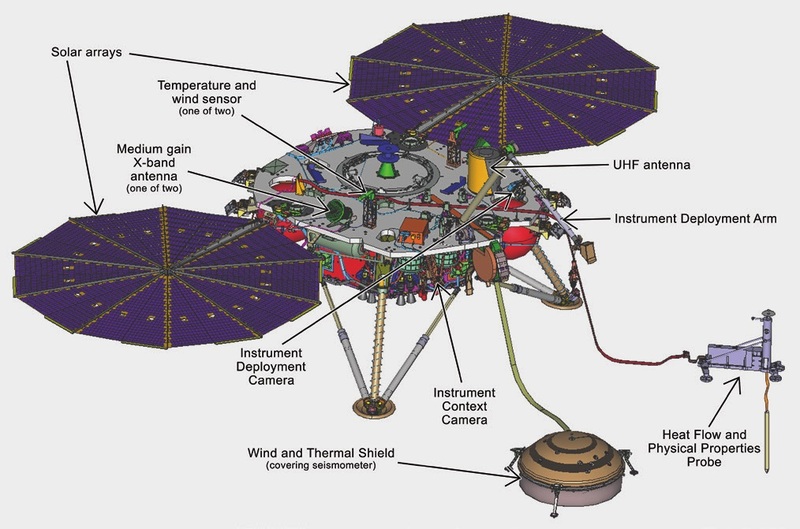 Its array of instruments will teach us about the Martian interior, granting us insight (see what they did there?) into the past and present of Mars and the other rocky planets in the solar system, including Earth. Bruce Banerdt, principal investigator for the mission at NASA’s Jet Propulsion Laboratory, has been pushing for this mission for more than two decades, after practically a lifetime working at the place. “This is the only job I’ve ever had in my life other than working in the tire shop during the summertime,” he said in a recent NASA podcast. He’s worked on plenty of other missions, of course, but his dedication to this one has clearly paid off. It was actually originally scheduled to launch in 2016, but some trouble with an instrument meant they had to wait until the next launch window — now. 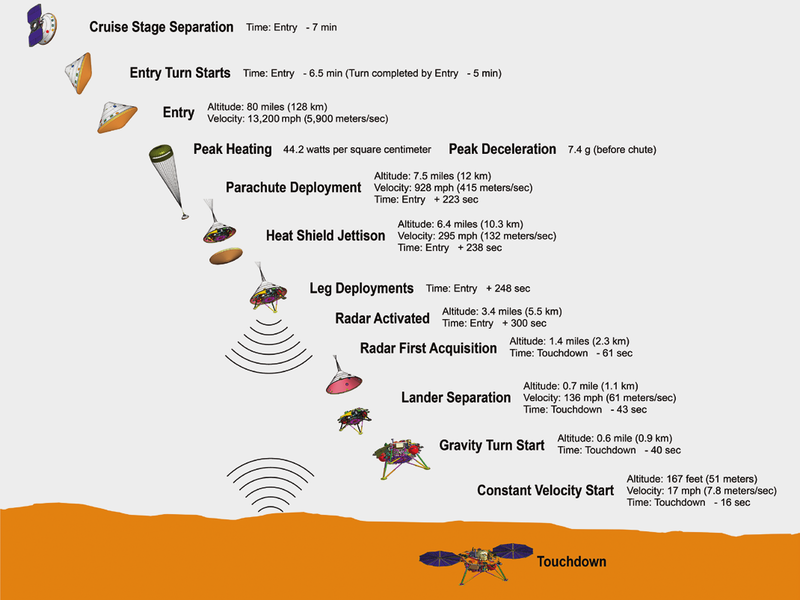 InSight is a lander in the style of Phoenix, about the size of a small car, and shot towards Mars faster than a speeding bullet. The launch is a first in itself: NASA has never launched an interplanetary mission from the West coast, but conditions aligned in this case, making California’s Vandenberg air base the best option. It doesn’t even require a gravity assist to get where it’s going. The Atlas V will take it up to orbit and the Centaur will give it its push towards Mars, after which it will cruise for six months or so, arriving late in the Martian afternoon on November 26 (Earth calendar). Its landing will be as exciting (and terrifying) as Phoenix’s and many others. When it hits the Martian atmosphere, InSight will be going more than 13,000 MPH. It’ll slow down first using the atmosphere itself, losing 90 percent of its velocity as friction against a new, reinforced heat shield. A parachute takes off another 90 percent, but it’ll still be going more than 100 MPH, which would make for an uncomfortable landing. So a couple thousand feet up it will transition to landing jets that will let it touch down at a stately 5.4 MPH at the desired location and orientation. After the dust has settled (literally) and the lander has confirmed everything is in working order, it will deploy its circular, fanlike solar arrays and get to work. InSight’s mission is to get into the geology of Mars with more detail and depth than ever before. To that end it is packing gear for three major experiments. SEIS is a collection of six seismic sensors (making the name a tidy bilingual, bidirectional pun) that will sit on the ground under what looks like a tiny Kingdome and monitor the slightest movement of the ground underneath. Tiny high-frequency vibrations or longer-period oscillations, they should all be detected. The heat flow and physical properties probe is an interesting one. It will monitor the temperature of the planet below the surface continually for the duration of the mission — but in order to do so, of course, it has to dig its way down. For that purpose it’s installed with what the team calls a “self-hammering mechanical mole.” Pretty self-explanatory, right? The “mole” is sort of like a hollow, inch-thick, 16-inch-long nail that will use a spring-loaded tungsten block inside itself to drive itself into the rock. It’s estimated that it will take somewhere between 5,000 and 20,000 strikes to get deep enough to escape the daily and seasonal temperature changes at the surface. Lastly there’s the Rotation and Interior Structure Experiment, which actually doesn’t need a giant nail, a tiny Kingdome or anything like that. The experiment involves tracking the position of InSight with extreme precision as Mars rotates, using its radio connection with Earth. It can be located to within about four inches, which when you think about it is pretty unbelievable to begin with. The way that position varies may indicate a wobble in the planet’s rotation and consequently shed light on its internal composition. Combined with data from similar experiments in the ’70s and ’90s, it should let planetologists determine how molten the core is. In another space first, Insight has a robotic arm that will not just do things like grab rocks to look at, but will grab items from its own inventory and deploy them into its workspace. Its little fingers will grab handles on top of each deployable instrument and grab it just like a human might. Well, maybe a little differently, but the principle is the same. At nearly 8 feet long, it has a bit more reach than the average astronaut. One of the MarCO cubesats. Insight is definitely the main payload, but it’s not the only one. Launching on the same rocket are two CubeSats, known collectively as Mars Cube One, or MarCO. These “briefcase-size” guys will separate from the rocket around the same time as InSight, but take slightly different trajectories. They don’t have the control to adjust their motion and enter an orbit, so they’ll just zoom by Mars right as Insight is landing. CubeSats launch all the time, though, right? Sure — into Earth orbit. This will be the first attempt to send CubeSats to another planet. If successful there’s no limit to what could be accomplished — assuming you don’t need to pack anything bigger than a breadbox. The spacecraft aren’t carrying any super-important experiments; there are two in case one fails, and both are only equipped with UHF antennas to send and receive data, and a couple of low-resolution visible-light cameras. The experiment here is really the CubeSats themselves and this launch technique. If they make it to Mars, they might be able to help send InSight’s signal home, and if they keep operating beyond that, it’s just icing on the cake. You can follow along with InSight’s launch here; there’s also the traditional anthropomorphized Twitter account. We’ll post a link to the live stream as soon as it goes up.